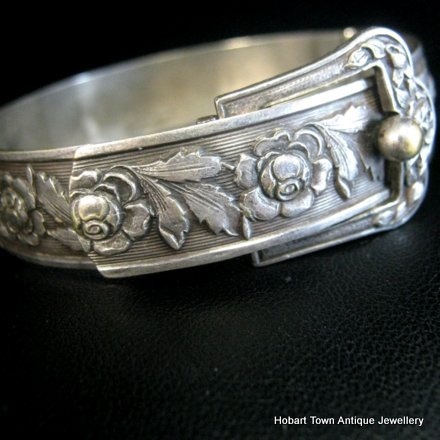 A treasure of a piece , this Edwardian St.Silver Buckle Bangle or Belt Bangle Beautiful Floral Decorated is as attractive as this type of antique bangle comes. 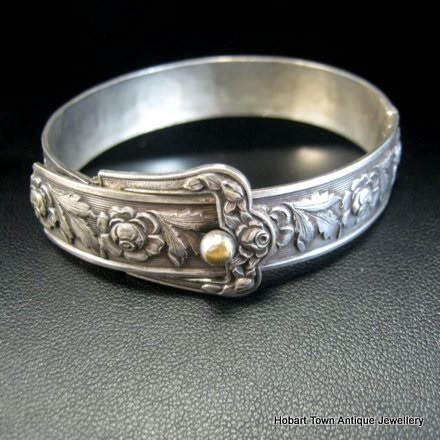 This Edwardian St.Silver Buckle Bangle or Belt Bangle Beautiful Floral Decorated is a remarkable example of its genre. 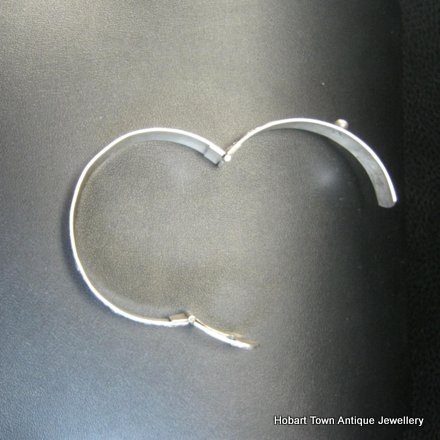 In immaculate condition for a 110 year old silver bangle / bracelet. Of true design genius , so easy to take off or place on your wrist ~ there is also beauty & style included with large quantities of both. As good in real life as these images indicate ~ this really is a gorgeous antique silver bangle that has stood the test of time beautifully! This one is a real standout in every respect. 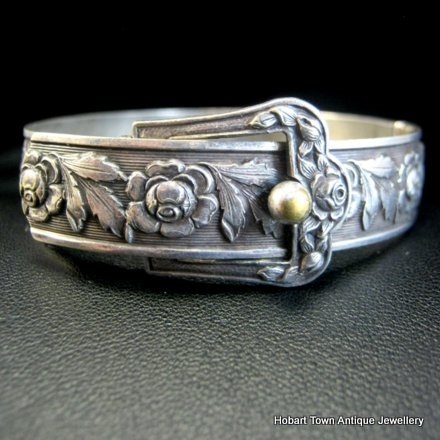 Note how this quality piece has the finely detailed Rose & Floral embossed decoration to the entire extremity of the bangle ~ unlike a large % that have the decoration only to the leading edge or front of the bangle! Just one difference between real quality or 2nd quality! 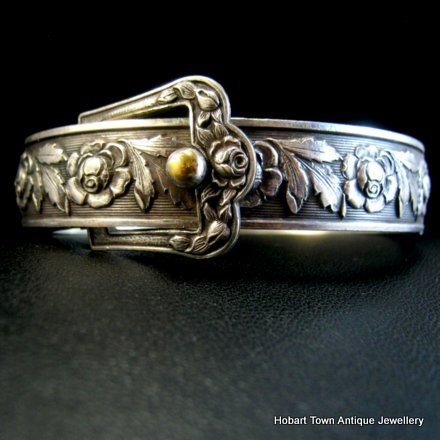 View the numerous images that we have provided for you to gain a good & clear understanding of this beautiful Edwardian bangle. Admire the skill levels of the craftsmen from over 100 years ago ~ using far more rudimentary tools than any contemporary jewellery does today! Yet so few can produce the work of their Edwardian & Victorian colleagues , with this remarkable piece. 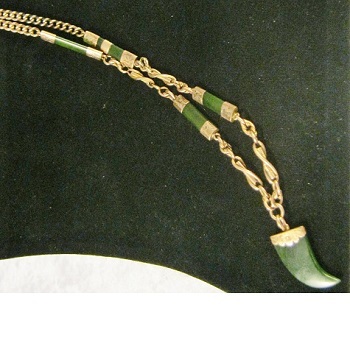 Yes , of course there are some jewellers that can reproduce such work ……….. BUT I assure you , you will be paying a Minimum of 10 x times the price of this antique example!! For a ‘non antique’ piece that starts to lose value the moment you pay for it! Compare what you can get elsewhere for au$575 or what this Quality piece ‘will cost elsewhere’ ~ that’s where the ‘No Brainer’ bit comes in! I would suggest that you will not buy a better one at a better price anywhere!! 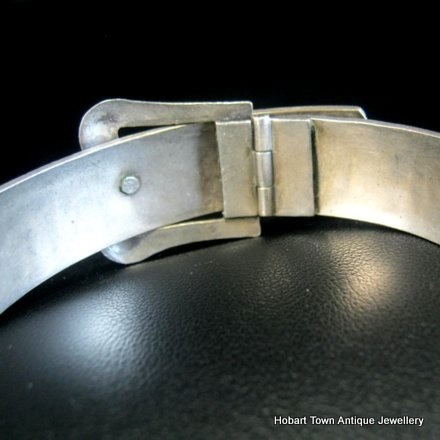 With a width of approx; 22 mms at the buckle & 15 mms at the main body with a standard internal of around 60 / 59 mms ~ this will happily accommodate most ladies wrists. 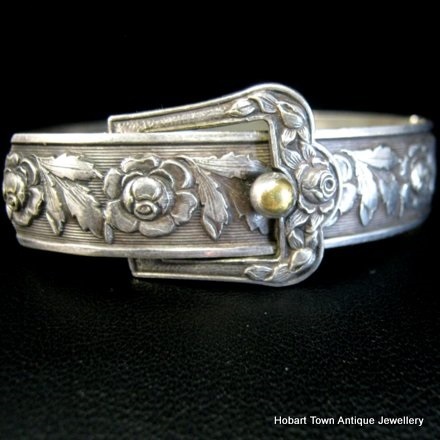 Made circa 1890 ~ 1910 & remaining in what I term as ‘mint antique condition’ ~ this quality piece has the beautiful Rose & Floral embossed decoration throughout the entire piece , not just to the ‘leading side’ or front as many of these bangles do. 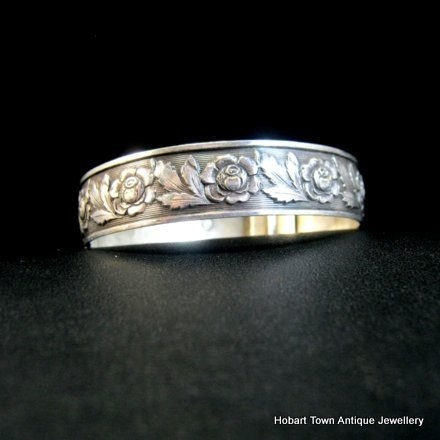 It can be slightly polished if a little more brightness is preferred yet as this beautiful piece has developed a fantastic patina over the past 110 years ….. I strongly suggest that it should not be polished too much. 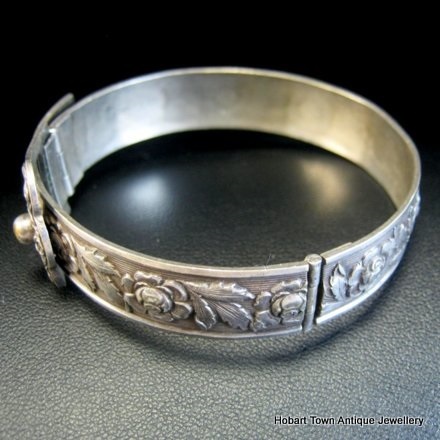 If you would like to ask any questions or to purchase this gorgeous Edwardian St.Silver Buckle Bangle or Belt Bangle Beautiful Floral Decorated throughout please email for a prompt response.